Are you unwillingly living in the Tiny Home movement? You may not have gone out of your way to find a living space that’s tiny, but it happened anyway. Or you’re in a unique home (usually older homes) that weren’t built for people with a lot of stuff. And we’re not stuff-shaming you. As much as you Marie Kondo Tidy Up, things add up as you live your life. The only question, after “do they bring you joy” is where do you put all these things? Especially when you’re low on closet or shelf space? You have to get creative. No one is better at getting creative than those who live in big cities – especially large European cities. Since most European city buildings were built 100+ years ago, they need to get creative with their extra storage. Keep reading to see what you can learn from them – and us. If you walk into any classic Parisian Haussmanian building and into a French person’s home, you may notice . . . it’s small. And the floors are usually squeaky. These buildings were built at the beginning of the 1900s when people were just getting in-home electricity and plumbing. Most families only had two or three pots and pans plus one set of dishes. Unless you were part of the bourgeoisie, but that’s a different story. As Paris has grown and gotten even more crowded (and the living spaces smaller), people have had to figure out how to crowd more stuff into less space. Walking around Paris, there are plenty of “convertible furniture” stores that prove the French have taken to this challenge. These are things like beds that fold up into an ottoman for when guests come over. Or Ikea-looking giant wall cabinets that host a bed at the top and a fold down table plus a closet. It’s quite impressive how many things one piece of furniture can be. But let’s assume you can’t fly to Paris or have this cool convertible furniture shipped to you. What should you do? Well, it’s time to take a trip to the container store, because we’re about to tell you how we’re doing our European-copying best. What can you do if you have stuff you can’t get rid of (like frying pans) but they don’t store nicely? Check out our first tip. One of our favorite European products is the removable handle frying pan. These pans exist just as the pan part until you clip a one-size-fits-all handle onto them. The handle stores in a drawer, or you can store it next to the stove. Without the handles, the pans stack nicely, nesting inside each other. 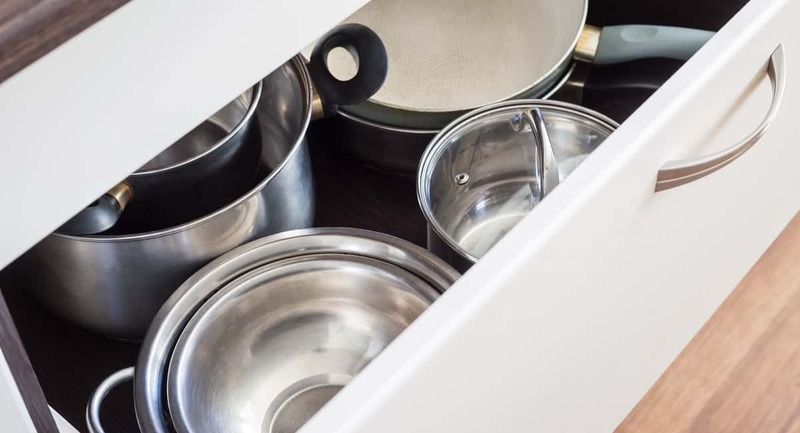 You don’t have to worry about pans falling and tipping when you’re trying to get a specific size, because the lack of handles makes stacking a breeze. You can find these pans at some specialty cooking stores or online. You may have to start out with just one or two additions since they’re expensive for what they are. But eventually, you can replace (and donate) all your old tilt-a-whirl pans in your cabinets! If you have an entryway, is there a chair or a bench where people throw their jackets? If you have the room, usually there is. But that air under the chair or bench is dead space. Instead of letting that storage space go to rest, find a bench/chair with storage built in. There are plenty of cute storage ottoman options that serve the original purpose and have a spot for extra stuff. Benches that open and close are perfect for puffy coats and mittens. If you don’t use them very often, use some vacuum storage bags to shrink them to a better storing size. That cleans up your space (makes it feel bigger), but getting rid of bulky items in your closets makes more space there as well. You can go to the dollar store and buy shallow bins, or even small gift boxes that will fit in these small spaces. They’ll divide the space into sections so everything has a place. You’re much more likely to put something away when you know where it goes – even if you’re normally a “throw it anywhere” type of person. When it comes to buying storage solutions, you’ll only be able to find what’s best for your space, given your options. That doesn’t always work. Perhaps you need a bigger storage bed than the ones you can truly afford. Well, don’t fret. You can still have the furniture you need that provides personalized storage options. How? By building custom furniture for your space. This doesn’t have to be expensive, and you don’t have to be a famous or trained carpenter. There are plenty of people who’ve already done the work for you. And thanks to the internet, their solutions can become yours, with or without some personalized touches. The most famous example of this phenomenon is the “Ikea Hack“. Ikea is a great store for storage solutions. A lot of their items can be used in ways that aren’t advertised on their site. Like their bookshelves, built for fabric cube storage. Did you know you can make a storage-friendly bedframe out of these? For a queen bed, it costs about 150 including supplies. You won’t find a queen bed frame with storage pre-made for anywhere near that price. How does it work? Well, in this specific example, you take three Ikea bookshelves and form a square-cornered “U” shape. Once you’ve attached all the bookshelves to each other, you secure a piece of thick plywood to the top of them. If you’re a heavier person, you can build support in the middle of the plywood for peace of mind. Then the mattress goes on top of all that. No need for a bulky bed spring, and now you have nine or twelve (depends on the shelf) cubbies for stuff. If you don’t want your storage to show, just throw a bed skirt (look for one that has longer sides) over the whole contraption and it’ll look like a normal bed. There are plans for kid-sized beds as well. You’ll find a lot of ideas on Pinterest and just by searching things like “Ikea hack bed”. The internet is a wealth of knowledge. If you search “kitchen storage hacks” you’ll see a bunch of options for using the space on the inside of your cabinet doors. Do you know your drawer full of plastic wrap boxes and aluminum foil that always gets stuck when you open it? What if you could free up that entire drawer and reduce your frustration? All you need is a cheap magazine holder and some command hooks or screws. Mount the magazine rack on the inside or the outside of the cabinet door. It should be sideways so one of the long sides is along the door and the opening is facing up. Put all your tall, skinny boxes we were talking about side by side, stacked on their short ends. Now you have an entire drawer free and you don’t have to argue with it to open/close anymore! Another favorite hack is using command hooks to store your measuring cups and spoons on the inside of the cabinet door. When you hang them all there, they can be nested, or not. Command strips are a life saver when it comes to creating storage because they stick to things that would be hard to drill through (like cabinets). They’re also removable, so they’re renter friendly. Got a collection of spices that would rival any Food Network star? They make command-type storage solutions for that too. Storage racks that stick on cabinet doors, or fridges, have little clasps that grab spice bottles. Now they’re all out in the open and easy to see/choose from when you’re cooking. Or, you can buy small tins that are magnetized (or add magnets yourself) and keep your collection on the side of the fridge. It’s up to you. You have to make the best of the space you have. We can’t all build extra storage buildings, like those you can view here. As you can see, the best extra storage tips come from people who’ve had to get creative before you. Their tried and true methods are worth investing in and the cost of, say, spice racks is well worth your sanity. Get creative when it comes to your space and spend some time on the internet, profiting from other people’s genius. When you’re done getting crafty, sit down and check out the rest of the education section.